In sports, just like in life, there are two types of people, the ordinary and the mavericks. The ordinary shall over time use their hard work to win hearts. Their achievements are built on the foundation of toil and the supporters’ claps are won gradually. But it’s the mavericks that win hearts instantaneously. They are the outliers; the ones who don’t believe in normalcy; the ones who are not destined to be normal. It is love at first sight. Lalaa is one such maverick, Shahid Afridi is one such maverick. As a child I remember seeing him walking out to bat against India in the 2004 Champions trophy with Pakistan struggling to chase a target of 200. It was swinging and Pakistan struggling. 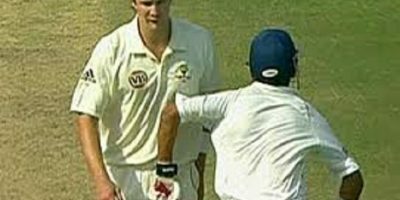 It was Irfan versus Shahid, Pathan versus Pathan, Indian versus Pakistani. In came Irfan Pathan, no long on, Shahid Afridi swung and bang it went. The next ball the intensity increased. In came Irfan Pathan, no long on, Shahid Afridi swung and bang it went. India lost that match; I lost my heart for a couple of days. Sorrow immersed me. But it still did not feel as terrible as I had expected. Somewhere deep down there was a faint smile. India had lost but lost to an improbable talent. A maverick that is rarely seen; even by Pakistani standards. We were the defending champions of Champions Trophy (shared it in 2002 with Sri Lanka) and even though we were in not so good form, a champion is defeated by talent, pristine talent. Lalaa, is one such talent, Shahid Afridi is one such talent. If sports were first played with the intention of pursuing joy, Afridi provided bucket-loads of it. His cricket was a gallimaufry of brilliance and untidiness. It was a juxtaposition of professional maturity and childlike amateurism. Whatever it was, it brought relief to a region torn by tribulations. It brought smile to faces that belonged to survivors of earthquakes, faces that belonged to people immersed in terror stormed grief. He brought smile across borders, transcending love and hatred. There is a reason he is UNICEF’s brand ambassador for the Polio Campaign in Waziristan. There is a reason why he said that he is blessed to have four daughters. As a youngster of 22 years, I remember watching the India versus Pakistan match of Asia Cup 2014. The match had been pretty close, with punches exchanged at every other moment. In the end it felt India would win. A hard fought match finally being won by the challenger. The defending champion losing to the resilient challenger. It was to be a fairy-tale ending and so everyone thought. Last over, Saeed Ajmal bowled around the leg on his first ball. Ashwin turning to be the hero. His carom ball turning heads and the wicket column alike. Junaid Khan comes in takes a single. 9 off 4. Champion to lose, challenger to win. It was to be a fairy tale ending and so everyone thought. But one man had other ideas. In comes Afridi and hits two sixes. Still a fairy tale ending but not as everyone had thought. Around 10 years from that Pathan versus Pathan over in England, Afridi did it again. It felt bad, but somewhere deep down there was a faint smile. India had lost to an improbable talent. A maverick that is rarely seen. Pakistan was the defending champion. It was being done and dusted with. But champions stay afloat due to pristine talent. Lalaa, is one such talent, Shahid Afridi is one such talent. If Sports were first played to depict life, Afridi has played the role of hero to perfection. Over years, cricket threw up many villains, people that were mercenaries going incognito in form of cricketers. Matches were fixed, passion was sold. But one man from Pakistan managed to stay out of the muck engulfing Pakistan Cricket. His name Shahid Afridi. For all his deficiencies as a cricketer, the colour of his passion remained impeccable. As an Indian, I wonder if there is a video of a sting operation showing a bookie saying, “Wo akela hi tha” about Shahid Afridi, just like there is one for Sachin. (The link to the PDF of the video can be found here: http://goo.gl/BDrq6u ). And that is how he might just be remembered. If there were heroes falling around him, he stood firm. The colour of passion, untarnished and grown stronger. With the world cup being only two months away, there was a feeling the announcement could come at any time. And it did come last week. The enigma of Shahid Afridi in ODIs ends this world cup. Enigma, because not many have managed to frustrate and jubilate like he has. Enigma, because not many have retired not once but twice before to come back and warm hearts. Enigma, because not many look the same over the years. Talking of the visage, may be it is because the joy has never gone off his face. He has been the school boy who played international cricket and shall retire as a school boy. The smile on his face was never too far. When he played, the smile on our faces was never too far. Cricket needs more people like him, the world needs more people like him. If he finally goes from ODIs and never comes back, he shall leave a legacy not matched by many. Some stories are not fully told by statistics alone, Afridi’s is one such story. A maverick, hated by many but loved by all. Ordinary cricketers might just belong to a nation, the mavericks like him always belong to cricket. Sahibzada Mohammad Shahid Khan Afridi, you have my respect.